The old teak as well as the foam on the addition has been glassed over and is now ready for the teak covering. 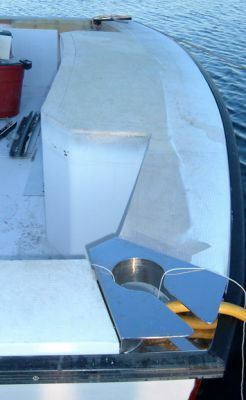 The aft gunnel includes the fishbox. 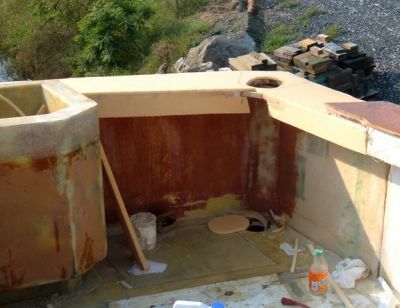 The foam has been glassed and the lid to the fishbox has been cut. It is now ready for the teak covering. The gunnels were built with the hawse pipe in mind. The intent is that the hawse pipe will be flush with the teak covering. We designed the hawse pipe before the extention had been completed and the port side did not fit exactly as we had anticipated. However, with a little carpentry magic, when installing the teak it should not be a problem. 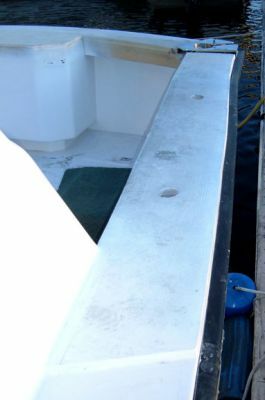 The gunnel was glassed directly onto the hull portion and thus ties it all together.